L-O-V-E Chrome Letter Opener in Pillow Box - EconoBride - Budget friendly wedding favors. 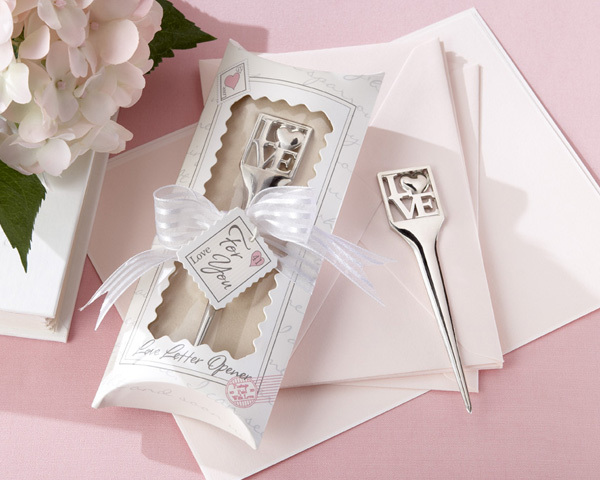 Our pretty and practical, 4 �� x 1� chrome L-O-V-E Letter Opener (the �O� in �L-O-V-E� is a full heart) is perfectly showcased in a cream-colored, 6 �� x 2 �� w x 1� d pillow box with a scalloped, clear window and the words �Love Letter Opener� at the bottom. Accenting the window are a �stamp� and a postmark. The stamp has a delicate pink heart and the word �Love.� The pink postmark says �Postage Paid With Love� along with �xo� (kisses and hugs!) A soul-stirring love letter in pale silver on the gift box, lends even more romantic interest. Tied around the center of the box are a charming, organza-and-satin-striped bow and a �For You� tag that matches the stamp on the pillow box. Simple, sentimental and absolutely stunning!